Paper sleeve (mini LP) edition with original jacket design! 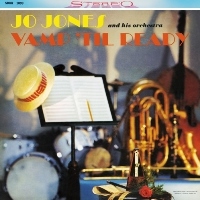 Jo Jones--sometimes called "Papa" Jones to distinguish from "Philly" Joe Jones--was one of the greatest jazz drummers and part of the "All American Rhythm Section" of the Count Basie Orchestra. This rare album was one of the two albums he recorded as a leader for Everest Records, an audiophile label known for their classical albums. This all-star sextet was fronted by three horn players--Harry Edison (tp), Bennie Green (tb) and Jimmy Forrest (ts), and the rhythm section consisted of Tommy Potter (b) and Tommy Flanagan (p), who is particularly brilliant throughout. Typical of his humility, Jones chose to support and push the group with his subtle drumming, instead of showcasing flashy drum solos, of which, by the way, he was perfectly capable. A heart-warming, swinging session with good playing all around! Recorded April 19, 1960 in New York City. Stereo. This reissue CD released in Japan by SSJ Records in 2015.